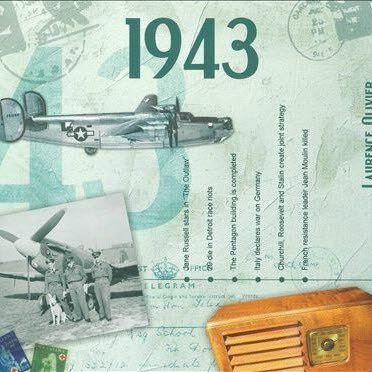 1943 Greeting Card with 20 Hits of the Year CD. The two-fold card, together with the included 20-track compact disc featuring many of 1943's top artists. biggest hits, evokes a real sense of the year. Celebrate a year of birth, year of marriage or any other anniversary or special day with this ideal Card and Gift in one. 1. Frank Sinatra - People Will Say We're In Love. 2.Irving Berlin - This Is The Army Mr. Jones. 3. Fats Waller & His Rhythm - Moppin' & Boppin. 4. Benny Goodman - After You've Gone. 5.Glenn Miller - Begin The Beguine. 6.Deanna Durbin - In The Spirit Of The Moment. 7. Ambrose And His Orchestra - Homeward Bound. 8.Turner Layton - As Time Goes By. 9. Patricia Burke - Never Say Goodbye. 10.Hutch - You Happen Once In A Lifetime. 11. Harry Roy - When Can I Have A Banana Again. 12.Alfred Drake - The Surrey With A Fringe On Top. 13. Sidney Bechet & His New Orleans Feetwarmers - St. Louis Blues. 14.Vince Hill - Pedro The Fisherman. 15. Anne Shelton - You'd Be So Nice To Come Home To. 16. Irving Berlin - My British Buddy. 17. Kay Kyser & His Orchestra - Who Wouldn't Love You. 18. Ambrose & His Orchestra - Comin In On A Wing And A Prayer. 19.Deanna Durbin - Say A Little Prayer For The Boys Over There.